the 13th annual Wine on the River. During the weekend of 11 - 13 October 2019, the banks of the Breede River on Goudmyn Farm will come alive with the valley’s esteemed winemakers, local chefs and producers. This picturesque centralized festival gives consumers the opportunity to taste award-winning wines from over 30 wineries. Unwind, relax and enjoy fresh country air, beautiful scenery and warm spring sunshine with an array of delightful treats, local country cuisines and great music. Taste in excess of 250 wines from more than 30 wineries. 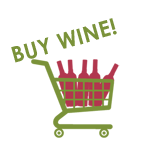 Wine is sold both for on-site or off-site consumption at cellar price! The ideal time to stock up on some favourites. Look out for the big marquee on the parking area to conveniently shop for wines to take home. Fill up your baskets with yummy treats for a vibey picnic on the banks of the river. Festival-goers can choose from hearty country fare and gourmet treats or simply shop for fresh produce to snack on at the market stalls. Enjoy a languid cruise along the Breede River. R50pp and book on the weekend at the Jetty from Hospice. Every festival needs some good tunes for attendees to croon to. Revel in your wine and the river while listening to top-notch live local acts like The Shakers, Lanky Jake and Newton and Co. The musicians will be taking to the stage at various interludes. This is a child-friendly festival. Activities include everything from petting zoo, boat rides, face painting, and more. Kids under 18 enter the festival area free of charge with activities charged on a pay-as-you-go basis. Enjoy the festival in a responsible manner. Use spittoons | Don’t drink on an empty stomach | Drink plenty of water | Don’t drink & drive | Be careful of topping up drinks | Choose a designated driver | Keep track of your wine consumption. This is a smoke-free festival. No smoking allowed on the festival grounds. Ticket prices range from R150 - R350 pp. We bring you helicopter flips again at a low rate of R300pp. Pre Book via QKR! app or on weekend at stall. Free WIFI proudly sponsored by Breedenet. HAVE AN MTB & TRAIL ADVENTURE! INTERACTIVE WINE TASTINGS IN THE #TASTETHELIFESTYLE TENT FACING THE RIVER. PROGRAMME AVAILABLE FROM SEP 2019. Hop on a wine safari truck with a winemaker and go on a journey to a nearby wine farm from the festival site. Drive through the vineyards, learn more about terroir and explore the underground cellars to discover the stories behind the wine. A once in a lifetime opportunity. PROGRAMME AVAILABLE FROM SEP 2019. From Cape Town take the N1 towards Worcester. Take the R60 turn off right towards Robertson. Robertson is about 40km further. Drive through the town of Robertson. At the traffic circle, turn right on the R317 towards Bonnievale. Festival Site is on Goudmyn Farm 13km further on your right hand side. Convenient designated parking areas will be clearly sign-posted en route. Shuttle services to Robertson are available. More information from A2B Tours here. 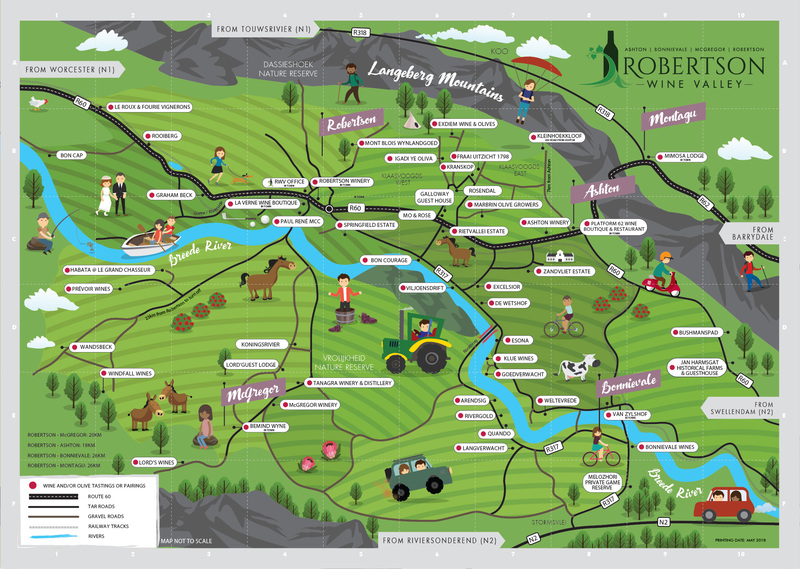 Robertson Wine Valley supports the ARA campaign. This campaign is focused on the prevention of the negative consequences of alcohol abuse. More information here. 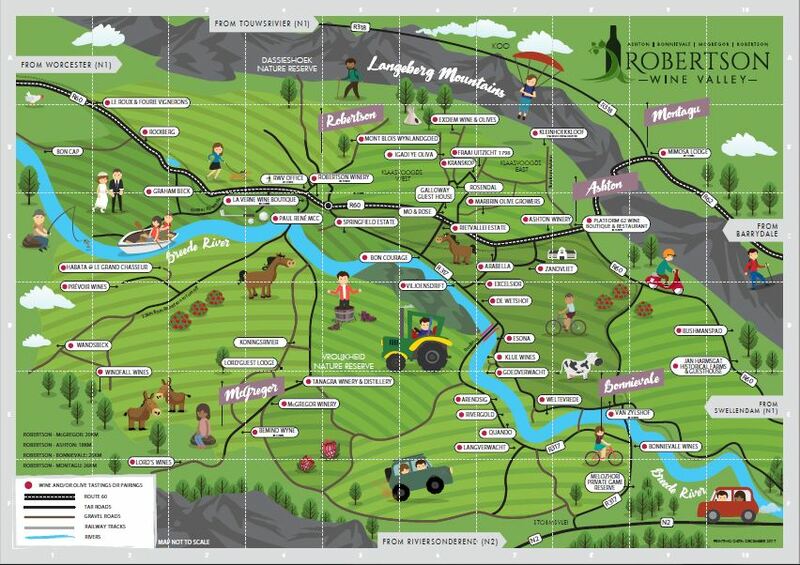 All trips are taken on own risk and that neither the Robertson Wine Valley, the organisers, staff, members nor companies used or their driver(s) will be responsible for any injuries or losses that may occur. In compliance with the laws of responsible serving of alcohol; Wine WILL NOT be served to intoxicated guests. Drunk or disorderly guests will not be permitted to remain on the premises Your safety is our concern – please taste responsibly – DON'T DRINK & DRIVE. Click below to download an area map.